CountMeInApp is the latest in gifting tech available to Facebook users worldwide. Founder Jeff Saul is on a rampage with his app that all allows customers to buy and gift a wide variety of items to their friends on Facebook. Users can choose gifts, create a gift registry and they can even pay amounts towards gifts instead of paying for the entire gift. Hold on, that’s not all… by any stretch. What makes CountMeInApp particularly powerful is that it gives the retailers serious power in the form of real time metrics. That is, retailers signed up with the app receive real time transactional data, reference data, and the activity of their customers. CountMeIn aims to assist brands and retailers in monetizing their fans and followers, using an easy-to-use, all-in-one solution to increase sales and conversions by bridging the gap of contribution, sale and collaboration. Whether your consumer shops on your existing dot.com environment, within your Facebook fan page or within our international Facebook mall, your consumer has the power to become an aspiring owner, collaborate on a gift purchase or simply buy an item outright. Web plug-in tool – adding branded gift collaboration to every product within your existing web assets enabling consumers to organize gifts for family and friends from anywhere in the world. Mobile technology – give your consumers access to a mobile storefront. 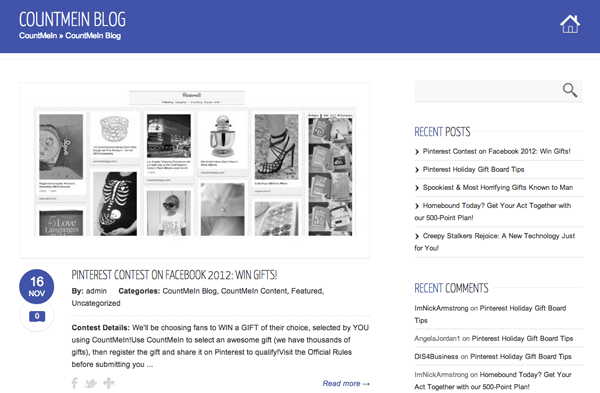 Dot.com, Pintrest and Facebook commerce solution. Pre and post sale data using our consumer intelligence engine. Optional QR technology – set up virtual storefronts anywhere, or capitalize on existing print mediums. For consumers, it’s a fun shopping experience that enables them to promote the products they want and love, with the added benefit of using an intuitive platform that can organize gifts for anyone across multiple platforms. We have just introduced one of the most technologically advanced social shopping platform for consumers and retailers, a social enterprise solution called CountMeIn. As the name suggests we are leveraging one of the oldest shopping practices, allowing users to collaborate on gifts from any where in the world. For the first time consumers can break down the international barriers of shopping together and make easy, effortless purchases for family and friends. Imagine being able to connect with family members anywhere within your social web, instantaneously select a product, promote and contribute to the purchase for a loved one or colleague. No more Western Union, waiting for a friend or family member to cough up that $20 or having to cover the last $50 to get that gift in time. CountMeIn is a multi-platform consumer shopping experience that allows institutions, merchants, consumers, and retailers the ability to collaborate on gifts together using their favourite social tools. To kick things off, a consumer can organize a gift directly from our expanding retail partner websites’ (using the “Organize a Gift” button), or within our international collaborative mall. Once a gift is created they can “Pin it” on Pintrest, promote it within Facebook or use Twitter to gather their friends and family together on the purchase. It’s so easy… it’s social gifting made easy. In North America, it’s a common practice to say “Count Me In” or “I’m In” when coming together to collaborate on an event, party, gift or almost any social activity. For us, this was a natural fit because people can now “count in” anywhere in the world. Com64. I first got on the web in the early 90’s when I started selling computers and retro-fitting homes with PCs and 32k modems. It depends. Typically, I’m working 14-16 hours per day. In August a friend was writing an article on RV’ing in Ontario, and was sponsored by RV Ontario to tour the parks of northern Ontario. In case anyone’s is traveling in Ontario don’t miss Tobermory as it combines the best of northern Canada with the feel of Aruba. Run the numbers and touch base with the team. We started with 2 in 2011 and now have 7 team members. A family member in California who spent his career building a billion dollar organization, coaching young entrepreneurs and now works with some of North America’s top executives to build their businesses. He once told me if you don’t take the risk you’ll never have the chance. Resources and timing. Being able to meet the work-back schedule so that we could enter the market with our full suite of offerings. Working out and spending more time with family always alleviates any frustration and pressures. Keeping a work/life balance is key, both individually and for our team. Biggest professional frustration is time. It’s a social and dog-friendly environment where having fun is part of our day. Self-funding. 17 years of sweat equity in retail. Build a board of advisors who can bring specific niche expertise to each functional area you may need support in. Backpack with my wife through the Asia Pacific. Let’s talk in Q4 2013 ! Peru. I want to see Machu Piccchu. 1 million items launched this month within our platform.